The water fed pole is a state-of-the-art filtration system that turns tap water into a powerful cleaning agent, eliminating the need for soap or chemicals. Ladders and poles are an important and versatile piece of equipment commonly used in commercial and residential window cleaning. AJ Window Cleaning, will provide transportable platforms in fixed length and modular systems. American Anchor is dedicated to helping building owners, property managers, architects and contractors understand how to meet the fall protection requirements of Federal OSHA and ANSI. 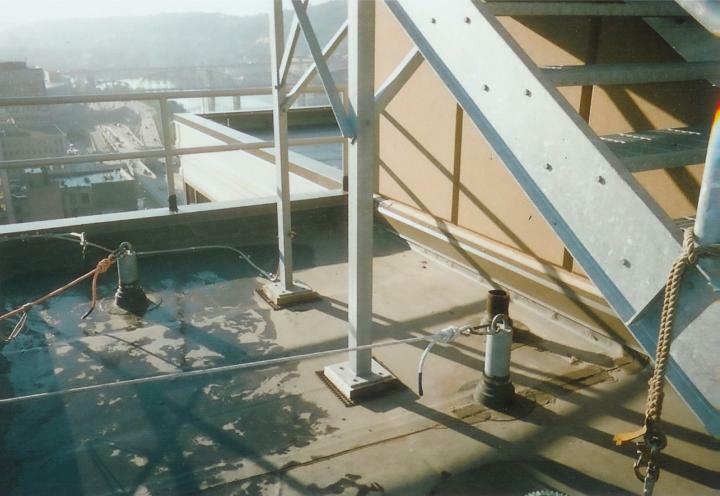 With more than 50 years experience in the window cleaning and building maintenance industries, our team of experts have exceptional ability with the design and installation of fall protection systems, which include adequate roof safety anchor points for suspended work. Formed in 1995 by people dedicated to the safety of suspended access workers and the prevention of falls in the workplace. While working in the suspended access business as career window cleaners since 1975, Bob Zeolla and Stefan Bright were acutely aware of the hazards that were presented on a daily basis. Most buildings had little or no adequate anchorages and the rigging practices of the day offered little assurance against a catastrophic accident. In fact, window cleaners and exterior building maintenance workers around the country were being injured and even killed because of this problem, and the resulting lawsuits cost building owners millions of dollars. As their extensive resumes show, Bob and Stefan became involved in the training and regulations to make a positive change. Eventually they put together a team of engineers, construction experts, and using the best resources available for products, American Anchor was formed. This original concern for workers has resulted in hundreds of buildings becoming safe for workers, the public, and owners.